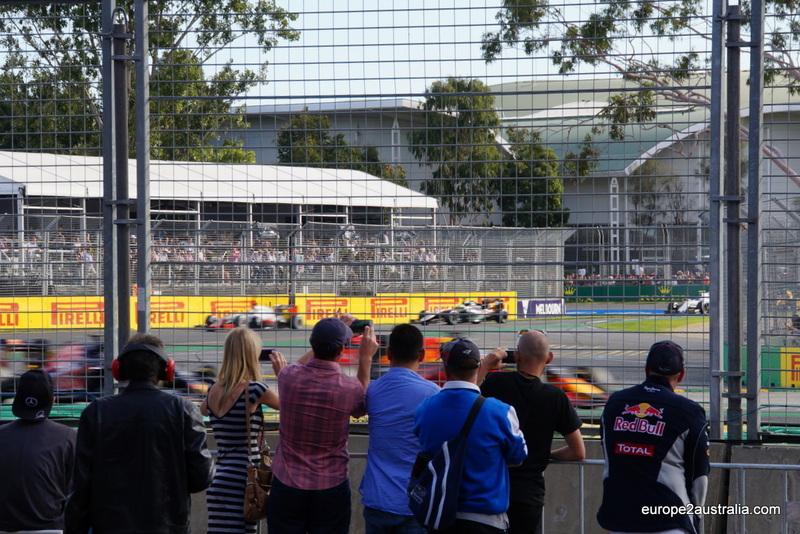 Last weekend, the new Formula 1 season (2016) kicked off with the Melbourne Grand Prix. And, while I am not a real petrol-head, I have always wanted to go to one of these races. So I took the chance that presented itself and went, together with a few colleagues of mine. What you don’t see (much) on TV is the fact that there is a whole range of activities arranged around the race. And it’s not just one day, either. Preparing the racetrack starts several weeks before the race. For most of the year, there are no pit, no fences and no grand stands. 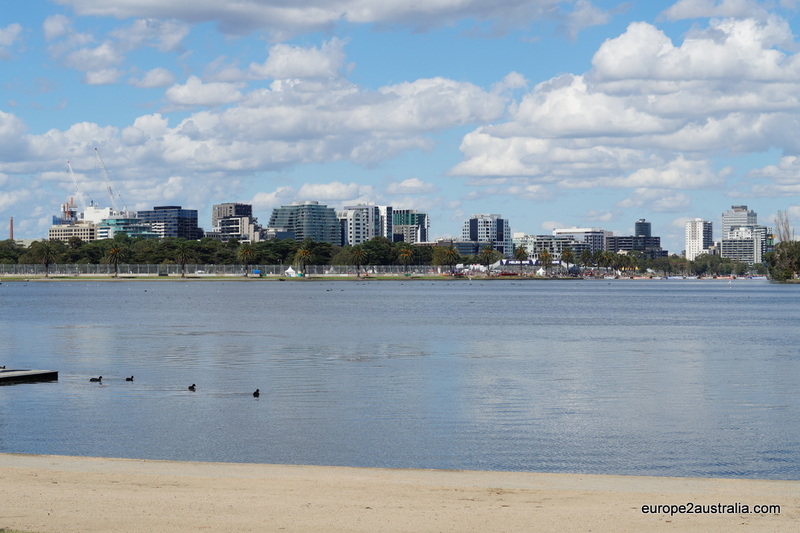 For most of the year, the place where the races are held is a great park in the middle of the city, with a lake, a golf course and a boating club. So all of the buildings and fences and grandstands need to be put in place, which takes the better part of the month. The race action starts on Thursday and Friday with some training sessions (which we could hear through the closed windows of our office). 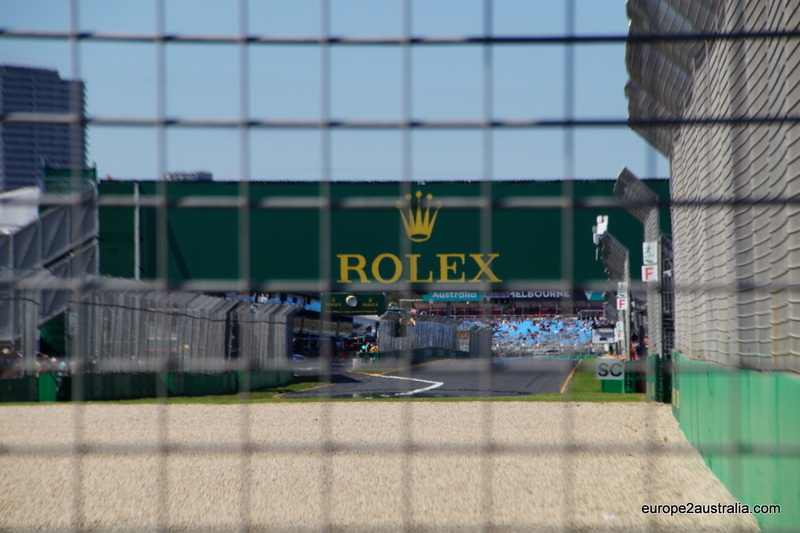 Qualifying takes place on Saturday and the race is on Sunday. And all around that there are several other races and activities to keep the track occupied. It was still pretty quiet when we got there on Sunday morning. Or maybe it was just the fact that we went in on one of the side gates. There was a mandatory checking of the bags. You were allowed to bring in your own food and drinks, but no alcohol. Happily I made use of that as the food at the races was expensive and, in the end, not all that great. 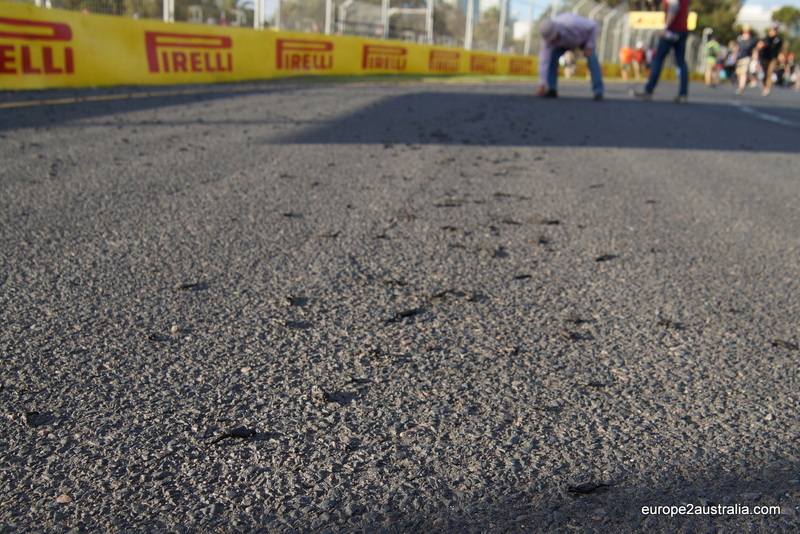 Albert Park Lake is at the centre of the action, with the track circling around it. For the rest of the year, this is a great place to go running. 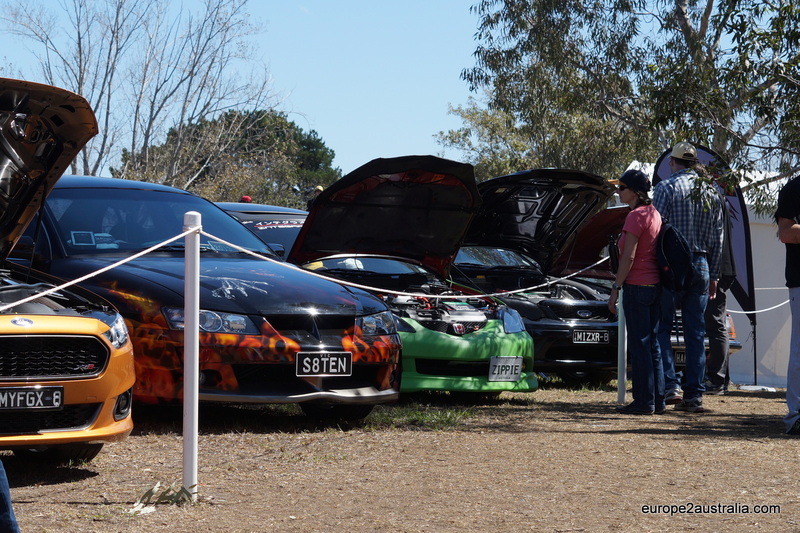 One of the “side shows” was an exhibition of tuned-up cars. Something for the petrol-heads. 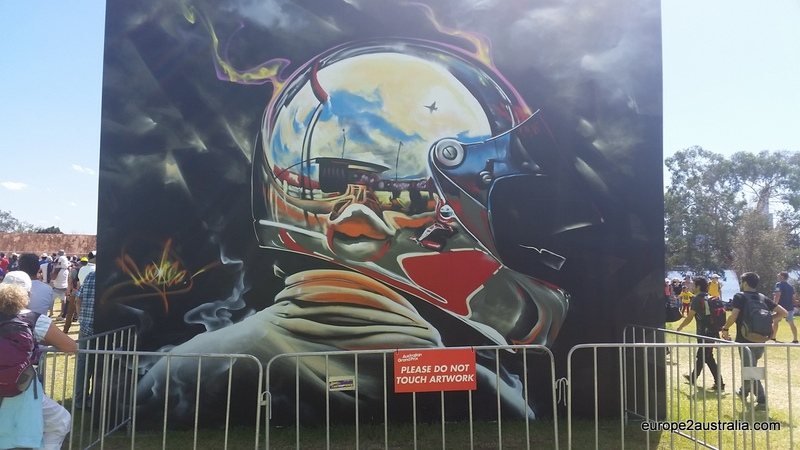 Another attraction was a collection of overseas containers being decorated with graffiti art. I especially liked this one. 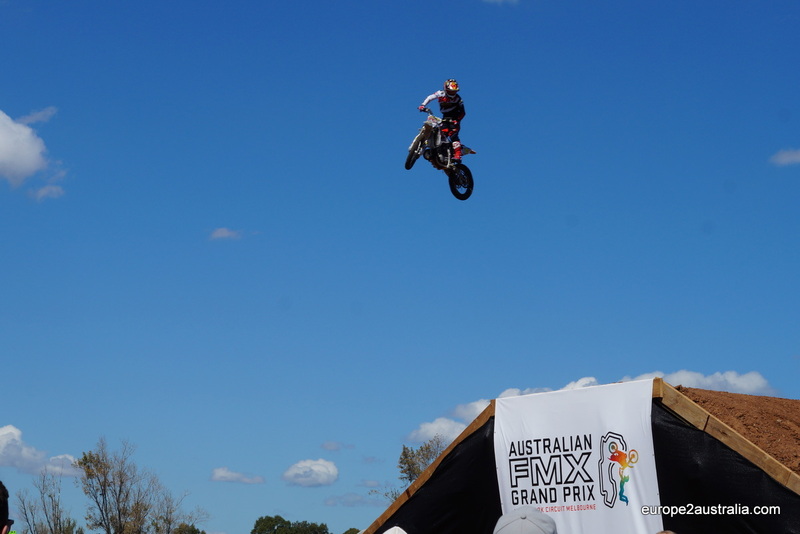 The Australian FMX Grand Prix was held at the site as well. Quite the daredevils on their motorbikes. 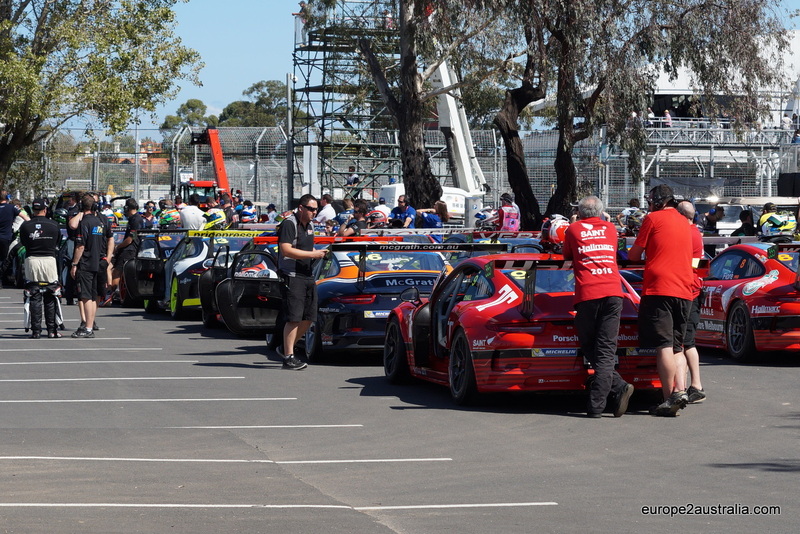 The Porsche Cup was one of the pre-races. Here they are getting ready for their final race of the weekend. But, of course, there was a bit of F1 here. 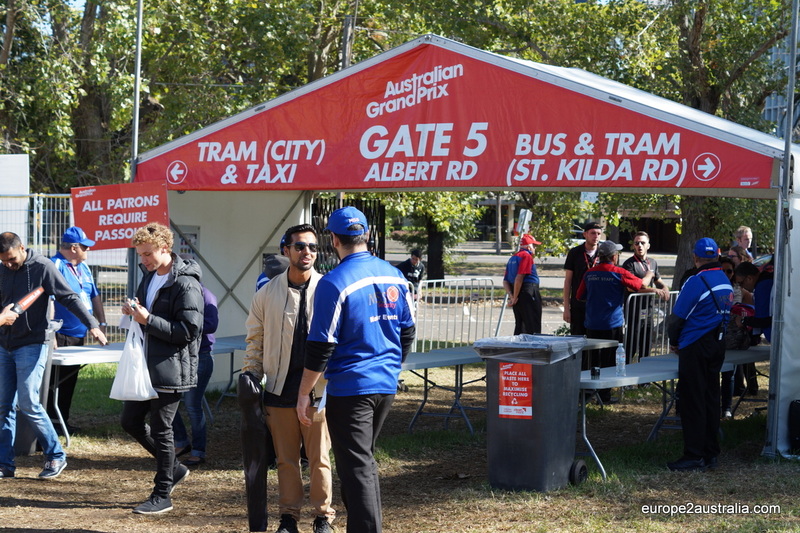 The big teams had their merchandising tents up, where you can buy your shirts and caps to show your support. 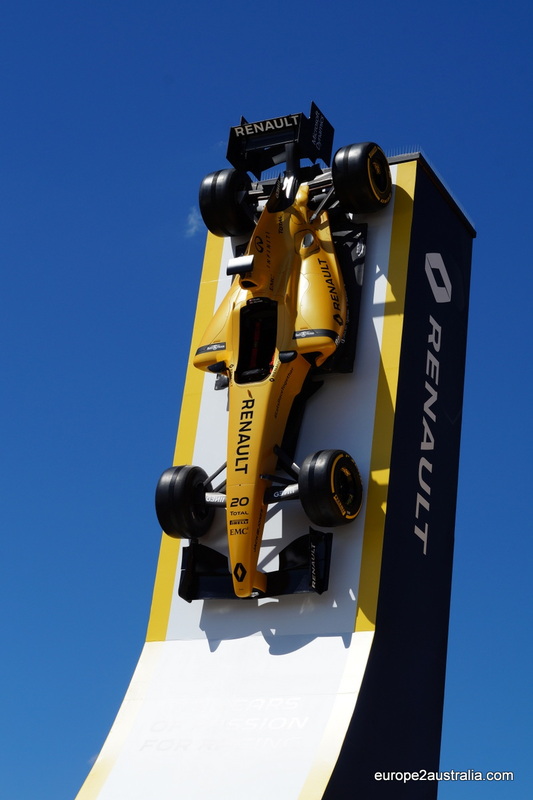 Renault had their car glued to a ramp sticking into the blue sky. Looked pretty cool. 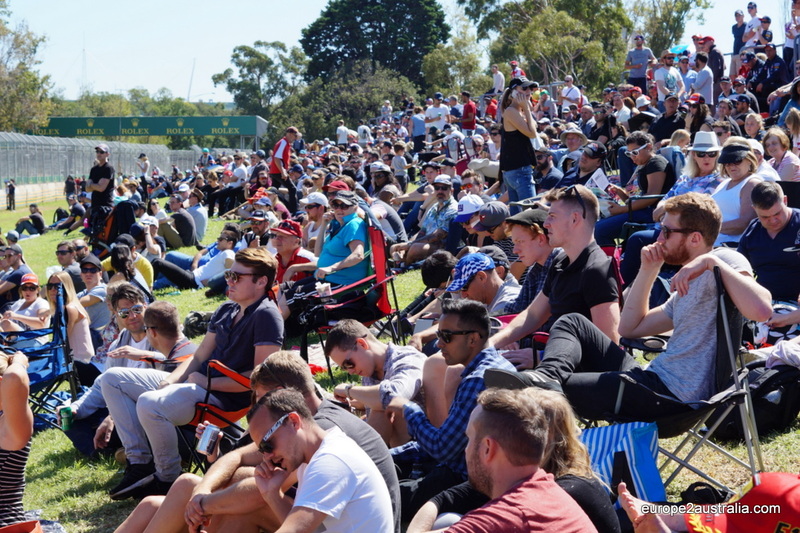 As the day went on, the spectators found their places on the grandstands and hills surrounding the track. But before the race finally got under way, there was an air show. 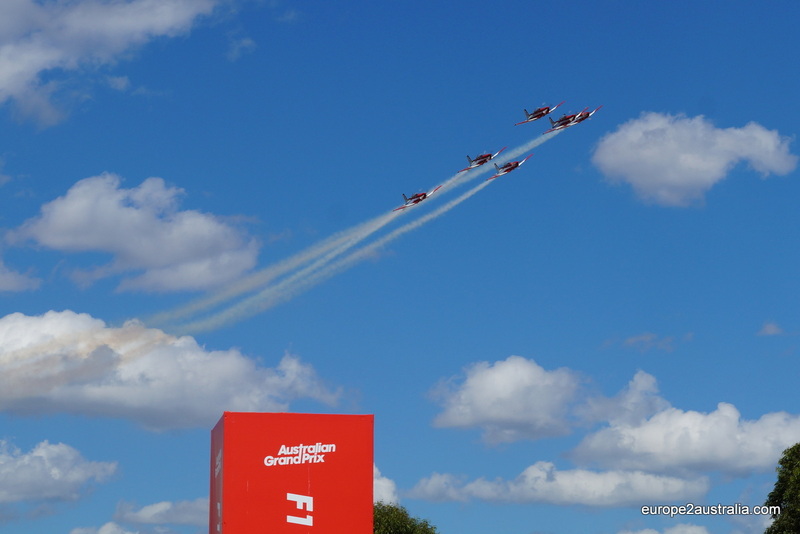 These were the RAAF Roulettes. 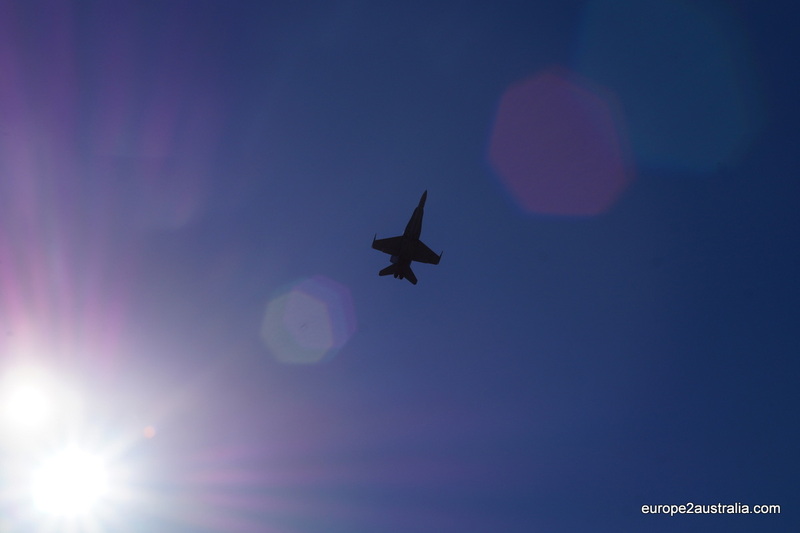 And here a RAAF F18 flew above the track, making quite some noise. The race itself was quite spectacular as well. The race itself was quite exciting, even though it was overshadowed by a quite spectacular crash. Luckily we had a big screen right across from where we stood, so we actually knew what was going on. So, overall, a very nice day. 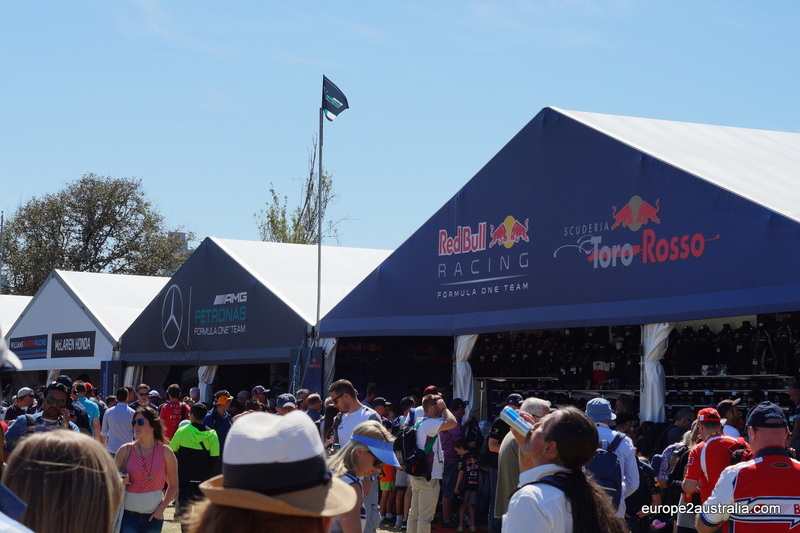 Lots to do, lots to see, and there was even a F1 race! And the great weather definitely helped. Would I go again? Yes. Is it something for the (our) kids? Not so much. This is one of those events that are geared for adults and happily does not go out of its way to cater for young children.